Every visitor to Can Tho will inevitably spend at least a morning at Cai Rang floating market, a vibrant, colourful and revealing symbol of the MekongDelta’s largest city. Life at Cai Rang floating market rises before the sun. By 5am the market is up and running. It is essentially a floating, wholesale greengrocer’s. 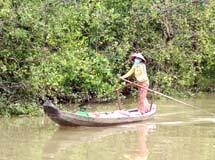 Traders come from across the Mekong’s network of waterways and canals to buy and sell fruit and vegetables. The floating market is like a village. People come for the wholesale market but additional trades flourish as a result of this mercantile gathering. You can buy breakfast – half-hatched egg, hu tieu or pho noodle soup, chao ca (rice porridge with fish). You can also find medicine, clothes, cosmetics, and many other odds, and ends. You can even find people selling lottery tickets. The boats also double as homes. People hang washing ‘on the line’ or place potted plants on the deck. Inside you will find furniture – tables and chairs, and beds. 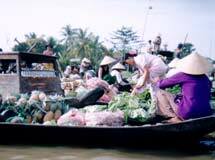 Some locals tell us that the floating market is not as crowded as it used to be as many merchants sell their products on the river bank. Although it is still an appealing destination for visitors, many of the traders want the market to be managed more carefully in order to preserve the market and improve living conditions.